Among the best Gopro stabilizers on the market, a duel is particularly interesting. The Gopro Karma Grip vs Removu S1 fight is perfect and you’ll see that these two gimbals are really excellent. Yet, in order to help you find the one you need, we’ll try to show their differences. On some points, these two gimbals are really similar. On others, there is a significant difference and you’ll discover this in our Gopro Karma Grip vs Removu S1 comparison. Let’s start this Gopro Karma Grip vs Removu S1 comparison with what makes a real big difference between these two gimbals. We won’t do as usual, that is to say go into details in the 6 criteria that constitutes our Removu S1 review, for instance. As always, we won’t do a description of these two gimbals, as there would be no point in doing it. Indeed, if you want to discover these two, we invite you to read our in-depth reviews. Here, our goal is to help you compare these two stabilizers which contributes today at our Gopro Karma Grip vs Removu S1 fight. We will therefore put forward their differences in order to help you find the best of them ! Without wasting any more time, discover our Gopro Karma Grip vs Removu S1 comparison. Let’s start it ! The very big asset of the Removu S1 is to be perfectly detachable. In other words, you’ll be able to separate the grip and the stabilizer part in a few seconds only. This function really pleased us during our Removu S1 review and you’ll see that it makes this Gopro Karma Grip vs Removu S1 comparison even more interesting. With the latter, you’ll very easily manage to fix your stabilizer on a helmet, a harness, a ski, a car, well, basically everywhere where you could fix a Gopro. The very big asset there is that the stabilizer will work remotely, without any cable, thanks to a bluetooth connexion between your grip (which has the software and everything) and the remote which is included for free in the package. For a very long period, the Gopro Karma Grip would have been destroyed by its opponent in this section. BUT, since April 2017, the American facturer has reduced the gap thanks to its very useful accessory : the Gopro Karma Grip extension cable. In fact, thanks to it, you’ll be able to separate your stabilizer from its grip and fix it, for exemple, on your helmet. The only constraint is the length of the cable to which it needs to be connected. The latter is 35 inches long, which is definitely less convenient than the bluetooth connexion of the Removu S1. Thanks to this advantage, the point for this criterion of our Gopro Karma Grip vs Removu S1 comparison goes to the second. Well, our title is pretty explicit… The Gopro Karma Grip is unfortunately not water resistant, contrary to its opponent, the Removu S1. Therefore, you won’t be able to use the Gopro Hero 5 Black to its full potential with the Karma Grip. As we’ve seen during our Removu S1 Review, it is perfectly water resistant and will work under heavy rain or snow, which is a real advantage. Real asset, it will enable you to protect not only the Hero 5, but also the Hero 3 and 4 thanks to a protection chamber which is perfectly waterproof. On the other side, the Gopro Karma Grip is really robust and its quality has really been proven during our Gopro Karma Grip review. 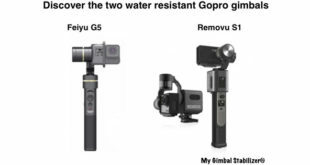 Still, the difference as far as the water resistance is concerned gives a second point to the South-Korean gimbal in our Gopro Karma Grip vs Removu S1 comparison. In fact, the best Gopro stabilizer really impressed us during our test and we had nothing to complain about at the end of our review. As far as the battery life is concerned, one more time, the advantage clearly goes to the Removu S1. Indeed, the Gopro Karma Grip is very disappointing in this section, hence its bad grade of 7.8/10 in our in-depth review. With it, you can count on a battery life of approximately 1h40 minutes which is very limited. 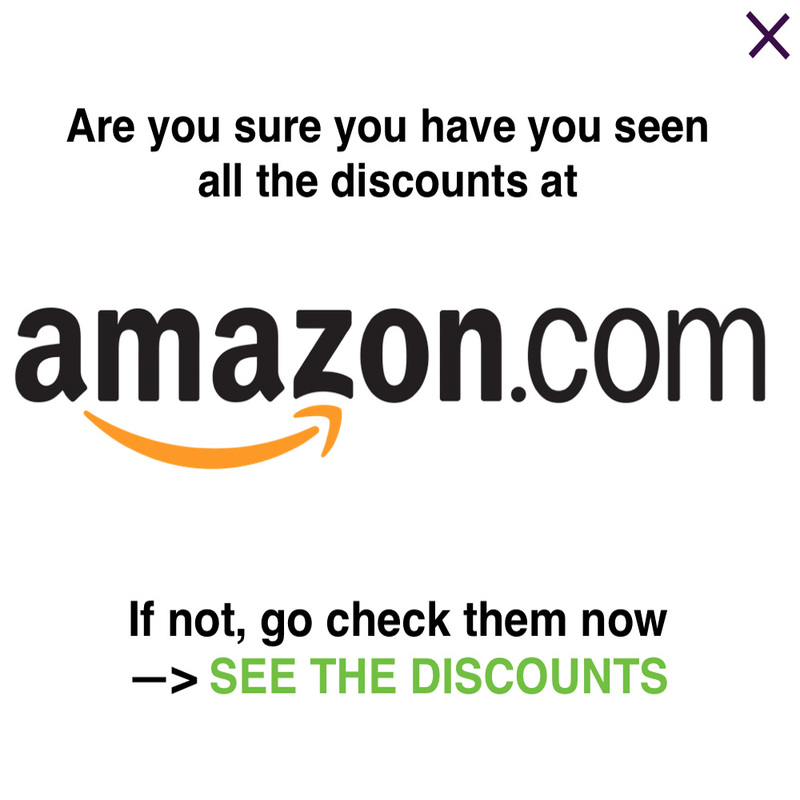 You’re certainly bound to buy 1 or 2 more batteries if you want to go for a full day of video recording. On the other side, the Removu S1 boasts a very good battery life of approximately 4 hours during our review which was made in the mountain under temperatures between 5 and 14°F. One more time, the point of our Gopro Karma Grip vs Removu S1 comparison goes to the second without any doubt. As far as the taking in hand and controlling are concerned, it is very difficult to find a significant difference between the Gopro Karma Grip and the Removu S1. In fact, the Gopro gimbal Removu S1 is really good at it and we really enjoyed the fact of being able to control the stabilizer with the remote within a range of 30 feet. We truly liked that during our test. On the other side, what we really enjoyed was the fact that its opponent is perfectly adapted for ITS camera. Indeed, as you can see in our Gopro Karma Grip review, everything has been perfectly designed to have a perfect control on the camera directly from the grip. You’ll therefore never have to touch your Gopro while you’re using your gimbal. Thanks to its 4 buttons, the control is really easy and convenient. 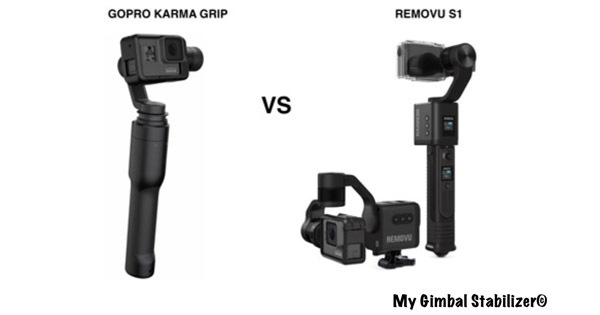 It is therefore very hard to know who wins this category of our Gopro Karma Grip vs Removu S1 comparison. Maybe, the advantage is very slightly in favor of the American stabilizer. As far as the stabilization is concerned, we are here with 2 excellent products. 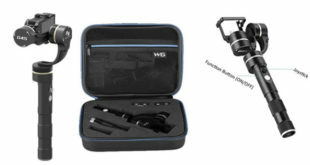 Indeed, the performances are just awesome and we graded these 2 gimbals with 9.5/10 and 9.6/10 in our in-depth reviews. These are really the bests you can find on the market for the time being ! 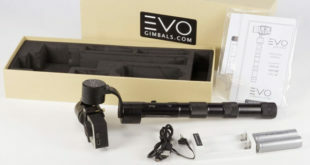 The EVO GP PRO also got the grade of 9.5/10, then, there is quite a gap with the other competitors. It is totally impossible to find a winner for this criterion of our Gopro Karma Grip vs Removu S1 comparison. Finally, to conclude this Gopro Karma Grip vs Removu S1 comparison, what can talk about the price difference. In this category, it is the Gopro Karma Grip which takes the advantage with a price 80$ below its opponent. Indeed, between the 299$ of the Gopro Karma Grip and the 379$ of the Removu S1, there is quite a gap which might influence your choice. Even though this Gopro Karma Grip vs Removu S1 comparison was globally won by the Removu S1, the Gopro Karma Grip is still a very good gimbal. If you buy a few batteries, the battery life issue will be solved and the fight would be way more difficult to judge. On the main points, which are the quality, reliability, taking in hand, controlling, and, of course, stabilization, these two gimbals really do very well ! Well, as you’ve seen, the Gopro Karma Grip is cheaper than the Removu S1. Yet, if you want to use the separation between the grip and the stabilizer, you’ll need to buy the extension cable…which costs 120$… Therefore, the price of the Gopro Karma Grip goes ahead of the one of the Removu S1. In the end, our Gopro Karma Grip vs Removu S1 comparison turns out to be won by the second, according to us. Still, the two are really worthy of interest. No matter your choice, you’ll be more than happy with your gimbal. Note that for a extreme sport use (like freestyle skiing), we would advise you tu buy the Gopro Karma Grip which is lighter and easier to use in such kind of situations. We hope that this Gopro Karma Grip vs Removu S1 review has been useful and we truly thank you for your visit.